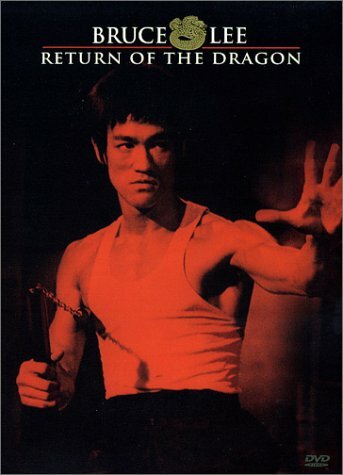 Bruce Lee wrote and directed Return of the Dragon, his third film, a mix of hard-edged kung fu and goofy humor. Once again he plays the country boy who travels to a foreign land, in this case Italy, where his restaurant-owning cousins face trouble from the local syndicate. Their strong-arm tactics have driven customers away and now threaten the family, but Lee refuses to buckle under their pressure and takes them on in a series of impressive confrontations. The film ends with a memorable showdown with world-champion karate artist Chuck Norris in the Roman Colosseum (though much of it is staged in a rather cheap studio set), a brutal, almost inhuman battle that revels in the intense punishment taken by the combatants. Norris is one of Lee's best opponents and a marvelous physical contrast: brawny and hairy, using power and blunt karate moves while lean, wiry Lee counters with speed, gymnastic prowess, and balletic grace. The mix of comedy and kung fu comes off as camp at times, but that's hardly the reason to see the film. When Lee gets into action, whether he's taking on a gang of knife-wielding thugs or dueling Norris to the death, he becomes the total focus. Originally titled The Way of the Dragon, this film was renamed in the wake of Enter the Dragon to cash in on that movie's popularity. Copyright 2001-2009: AllBruceLee.com. All rights reserved.